The mitre is a kind of folding-cap. It consists of two like parts, each stiffened by a lining and rising to a peak; these are sewn together on the sides, but are united above by a piece of material that can fold together. Two lappets trimmed on the ends with fringe hang down from the back. The mitre is, theoretically, always supposed to be white. The official "Cæremoniale Romanum" distinguishes three kinds of mitres: the mitra pretiosa, auriphrygiata, and simplex. The first two differ from each other only in the greater or less richness of the ornamentation; the mitra simplex, or simple mitre, is one of white silk or white linen entirely without ornament. The fringe on the lappets at the back should be red. The bishop must wear the mitra pretiosa on those days on which the hymn Te Deum is used in the Office, the mitre auriphrygiata in the seasons of Advent and Lent, on fast days and during penitential processions, the mitra simplex on Good Fridays, at funerals, and at the blessing of the candles on Candlemas-day. When bishops attend a general council, or are present at solemn pontifical acts of the pope, they wear a plain linen mitre, while the cardinals on occasions wear a simple mitre of silk damask. The right to wear the mitre belongs by law only to the pope, the cardinals, and the bishops. Others require for its use a special papal privilege. This privilege is possessed, for example, by numerous abbots, the dignitaries of many cathedral chapters, and by certain prelates of the papal Curia, but, as a rule, the right is more or less limited: for instance, such prelates can only use a simple mitre of white linen, unless the contrary is expressly granted them. The mitre is distinguished from the other episcopal vestments in that it is always laid aside when the bishop prays; for example, at the orationes of the Mass, of the Office, in conferring Holy Orders, at the Canon of the Mass, etc. The reason for this is to be found in the commandment of the Apostle that a man should pray with uncovered head (1 Corinthians 11:4). The giving of the mitre is a ceremony in the consecration of a bishop. It occurs at the close of the Mass after the solemn final blessing, the consecrator having first blessed the mitre. From the seventeenth century much has been written concerning the length of time the mitre has been worn. According to one opinion its use extends back into the age of the Apostles; according to another, at least as far back as the eighth or ninth century while a further view holds that it did not appear until the beginning of the second millennium, but that before this there was an episcopal ornament for the head, in form like a wreath or crown. In opposition to these and similar opinions, which cannot all be discussed here, it is, however, to be held as certain that an episcopal ornament for the head in the shape of a fillet never existed in Western Europe, that the mitre was first used at Rome about the middle of the tenth century, and outside of Rome about the year 1000. Exhaustive proof for this is given in the work (mentioned in bibliography below), "Die liturgische Gewandung im Occident und Orient" (pp. 431-48), where all that has been brought forward to prove the high antiquity of the mitre is exhaustively discussed and refuted. The mitre is depicted for the first time in two miniatures of the beginning of the eleventh century; the one is in a baptismal register, the other in Exultet-roll of the cathedral at Bari, Italy. The first written mention of it is found in a Bull of Leo IX of the year 1049. In this the pope, who had formerly been Bishop of Toul, France, confirmed the primacy of the Church of Trier to Bishop Eberhard of Trier, his former metropolitan who had accompanied him to Rome. As a sign of this primacy, Leo granted Bishop Eberhard the Roman mitre, in order that he might use it according to the Roman custom in performing the offices of the church. By about 1100-50 the custom of wearing the mitre was general among bishops. The pontifical mitre is of Roman origin: it is derived from a non-liturgical head-covering distinctive of the pope, the camelaucum, to which also the tiara is to be traced. The camelaucum was worn as early as the beginning of the eighth century, as is shown by the biography of Pope Constantine I (708-815) in the "Liber Pontificalis". The same headcovering is also mentioned in the so-called "Donation of Constantine". The Ninth Ordo states that the camelaucum was made of white stuff and shaped like a helmet. 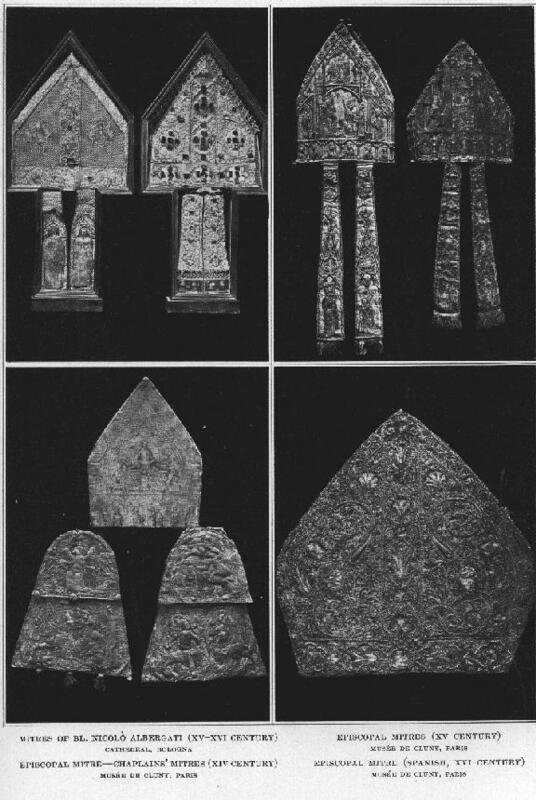 The coins of Sergius III (904-11) and of Benedict VII (974-83), on which St. Peter is portrayed wearing a camelaucum, give the cap the form of a cone, the original shape of the mitre. 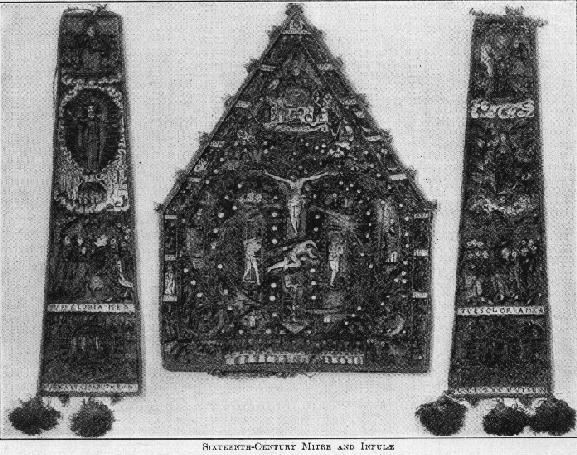 The camelaucum was worn by the pope principally during solemn processions. The mitre developed from the camelaucum in this way: in the course of the tenth century the pope began to wear this head-covering not merely during processions to the church, but also during the subsequent church service. Whether any influence was exerted by the recollection of the sacerdotal head-ornament of the high-priest of the Old Testament is not known, but probably not—at least there is no trace of any such influence. It was not until the mitre was universally worn by bishops that it was called an imitation of the Jewish sacerdotal head-ornament. The Roman cardinals certainly had already the right to wear the mitre towards the end of the eleventh century. Probably they possessed the privilege as early as in the first half of the century. For if Leo IX granted the privilege to the cardinals of the cathedral of Besançon (see CARDINAL: I. Cardinal Priests) in 1051, the Roman cardinals surely had it before that date. The first authentic granting of the mitre to an abbot dates from the year 1063, when Alexander II conferred the mitre upon Abbot Egelsinus of the Abbey of St. Augustine at Canterbury. From this time on instances of the granting of the mitre to abbots constantly increased in number. At times also secular princes were granted permission to wear the mitre as a mark of distinction; for example, Duke Wratislaw of Bohemia received this privilege from Pope Alexander II, and Peter of Aragon from Innocent III. The right also belonged to the German emperor. As regards shape, there is such difference between the mitre of the eleventh century and that of the twentieth that it is difficult to recognize the same ornamental head-covering in the two. In its earliest form the mitre was a simple cap of soft material, which ended above in a point, while around the lower edge there was generally, although not always, an ornamental band (circulus). It would also seem that lappets were not always attached to the back of the mitre. Towards 1100 the mitre began to have a curved shape above and to grow into a round cap. In many cases there soon appeared a depression in the upper part similar to the one which is made when a soft felt hat is pressed down on the head from the forehead to the back of the head. In handsome mitres an ornamental band passed from front to back across the indentation; this made more prominent the puffs in the upper part of the cap to the right and left sides of the head. This calotte-shaped mitre was used until late in the twelfth century; in some places until the last quarter of the century. From about 1125 a mitre of another form and somewhat different appearance is often found. In it the puffs on the sides had developed into horns (cornua) which ended each in a point and were stiffened with parchment or some other interlining. This mitre formed the transition to the third style of mitre which is essentially the one still used today: the third mitre is distinguished from its predecessor, not actually by its shape, but only by its position on the head. While retaining its form, the mitre was henceforth so placed upon the head that the cornua no longer arose above the temples but above the forehead and the back of the head. The lappets had naturally, to be fastened to the under edge below the horn at the back. The first example of such a mitre appeared towards 1150. Elaborate mitres of this kind had not only an ornamental band (circulus) on the lower edge, but a similar ornamental band (titulus) went vertically over the middle of the horns. In the fourteenth century this form of mitre began to be distorted in shape. Up to then the mitre had been somewhat broader than high when folded together, but from this period on it began, slowly indeed, but steadily, to increase in height until, in the seventeenth century, it grew into an actual tower. Another change, which, however, did not appear until the fifteenth century, was that the sides were no longer made vertical, but diagonal. In the sixteenth century it began to be customary to curve, more or less decidedly, the diagonal sides of the horns. The illustration gives a summary of the development of the shape of the mitre. It should, however, be said that the changes did not take place everywhere at the same time, nor did the mitre everywhere pass through all the shapes of the development. A large number of mitres of the later Middle Ages have been preserved, but they all belong to the third form of mitre. Many have very costly ornamentation. For even in medieval times it, was a favourite custom to ornament especially the mitre with embroidery, rich bands (aurifrisia), pearls, precious stones, small ornamental disks of the precious metals; and even to use painting. 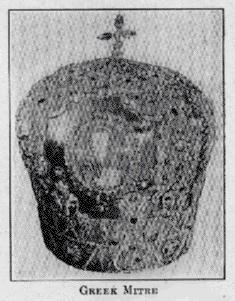 Besides several hundred large and small pearls, a mitre of the late Middle Ages in St. Peter's at Salsburg is also ornamented with about five hundred more or less costly precious stones; it weighs over five and a half pounds. Similar mitres are also mentioned in the inventory of 1295 of Boniface VIII. Eight medieval mitres are preserved in the cathedral of Halberstadt. In the seventeenth and eighteenth centuries the mitre was ornamented with rich, heavy embroidery in gold, which gave it a still more imposing appearance. A mitre of the eighteenth century preserved in the cathedral treasury at Limburg-on-the-Lahn is remarkable for the large number of precious stones that adorn it. The original material of the mitre appears to have been white linen alone, but as early as the thirteenth century (with the exception of course of the simple mitre) it was generally made of silk or ornamented with silk embroidery. In the Orthodox Greek Rite (the other Greek Rites need not here be considered) a liturgical head-covering was not worn until the sixteenth century. Before this only the Patriarch of Alexandria, who wore one as early as the tenth century, made use of a head-covering, and his was only a simple cap. The Greek pontifical mitre is a high hat which swells out towards the top and is spanned diagonally by two hoops; on the highest point of the dome-shaped top is a cross either standing upright or placed flat. DE LINAS, Anciens Vétements sacerdotaux, 2e série (Paris, 1862); BOCK, Geschichte der liturg. Gewänder, II (Bonn, 1886); ROHAULT DE FLEURY, La Messe, VIII (Paris, 1889); BRAUN, Die pontifikalen Gewänder des Abendlandes (Freiburg im Br., 1898); IDEM, Die liturgische Gewandung im Occident und Orient (Freiburg im Br., 1907). MLA citation. Braun, Joseph. "Mitre." The Catholic Encyclopedia. Vol. 10. New York: Robert Appleton Company, 1911. <http://www.newadvent.org/cathen/10404a.htm>. Transcription. This article was transcribed for New Advent by William Stuart French, Jr. Dedicated to Rt. Rev. Walter A. Coggin, O.S.B., Third Abbot Nullius, Belmont Abbey, Belmont, N.C., U.S.A.; Council Father, Second Vatican Council. Ecclesiastical approbation. Nihil Obstat. October 1, 1911. Remy Lafort, S.T.D., Censor. Imprimatur. +John Cardinal Farley, Archbishop of New York.